Dependable and trustworthy. Those are the two primary qualities you should look for in any type of service company that you invite onto your property. It is one of the reasons why we depend on positive word of mouth. If your friend has already found that a company can be counted on to deliver on what they promise, then you are more inclined to hire that company. You certainly aren’t going to hire a company that your neighbor has said to avoid at all costs! When it comes to professional junk removal, there is a company in Texas that has already earned a solid reputation. That would be Junk King. Any company that has been in business for a long time could be deemed trustworthy. It means they must be doing something right. 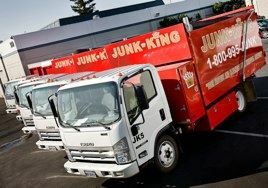 Junk King started operations back in 2005. As they come up on their ten-year anniversary, you’ll find that this national chain has a lot to be proud of. Their customers constantly give them high marks for services and reliability. Junk removal can be a competitive business. Too often, a company will quickly make an appointment with you knowing full well they are overbooked. That means you could be waiting for most of your day to get the job done. Junk King usually schedules appointments with a two-hour window. That means you should only be kept waiting from 9 to 11 or 12 to 2, etc. You’ll also be given a call updating you on the ETA. That’s something you’re not going to get with other companies. The Junk King crews have all been trained in the proper moving techniques. They know how to lift heavy objects to avoid personal injury. More importantly, they know how to carry those heavy objects out of your home without damaging your floors or walls. In the unlikely event that something would happen, Junk King is fully insured. Try to get that from a day laborer you pick up from Home Depot! Junk King is also very responsible with regard to disposing of your junk. Everyone who works for Junk King, lives in the area. They have a vested interest in making sure the environment isn’t harmed. That’s why they would rather drop something off at a recycling center or charity as opposed to a landfill. Check around and you’ll find that when it comes to expert junk removal, Junk King is really the only game in town. This entry was posted in Pasadena TX Junk Removal Company and tagged Junk King, junk removal on July 19, 2014 by Jose Urdaneta. Last updated August 1, 2017 .